Metal Detectors Require Tuning For Maximum Detection. Be Stored In A Warm Environment. in the player to your right. your Wizard Detector is still not working properly, email us at Billy@wizind.com. 1.Turn the unit on then depress the sound button. 2. Adjust the tuning screw to the far left, unit should beep constantly. 3. Very slowly turn the tuning screw to the right, stop turning as soon as the unit stops beeping. 4. The green light should flash every 3.5 seconds. 5. Turn off and back on. The green light should flash every few seconds. If alternating Green and Red Lights Flash Tuning Is Not exact so try again. Test detection with a small metal object. Red light will illuminate and unit will beep when metal is detected. The exact tuning is vital, especially the turning slowly and stopping at exact point where beep stops. It's a small area. Once this is done the unit should stay tuned. If not tune again and be as precise as possible. Occasionally the units need re-tuning if the temperature of humidity drop a lot. The fine tuning screw is used to set the working point of the detector. This allows you to compensate for differences in temperature and humidity, which can affect readings. During extended operation, use the fine tuning screw to change the working point as needed. Tuning is important as metal detectors are sensitive to ground balance (the mineralization content in the soil around us all) and the amount of humidity in the air. Tuning allows the detector coil to concentrate on high-density metallic materials instead of the metals in the earth. Keeping the tuning precise and doing it often helps to find more small metal pieces in wood. The difference in the Lumber Wizard vs other types of wands is the ability to better control detection strength through precise manual tuning. Other metal detectors with autotune features do not detect as accurately since they can't be tuned to a very specific level. Those types are typically used for security and they are commonly used to detect huge metal objects such as weapons. The Lumber Wizard is made to help detect wire, nails, screws, and small pieces of metal. Thus the importance of tuning often. Think of it as sharpening a blade! For best detection sweep the Lumber or Security Wizard in an up and down pattern at least 1/2" from the surface to be scanned. The detector coil area is the last 7” of the unit farthest from the handle. When passed over metal objects the unit will make a high pitched tone (if Audio Alert is turned on), or vibrate (if the Vibration Alert is turned on), and a red LED will also glow. The pitch will increase as you move the unit closer to metal. To pinpoint the exact location of metal sweep the Security Wizard slowly until a continuous tone is heard. Please be sure to store your detector in a warm place. Avoid storing below 40 degrees! Types of Metal Detected: Responds equally well to all types of metal, steel, stainless steel, zinc, magnesium, and aluminum. Helps locate guns, knives, blades, and any metallic object. 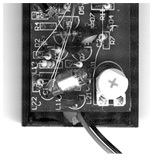 Electronics: Unit operates with an automatic tuning transmit/receive circuit. Provides precision detection pattern which helps prevent false alarms. Dimensions: Length 18”, Width 21/2”, Height 1 1/8” at sensor, 2” at handle, Weight: 13 oz. Power Requirements: One nine volt alkaline battery (not included). We use and recommend Duracell Alkaline batteries. 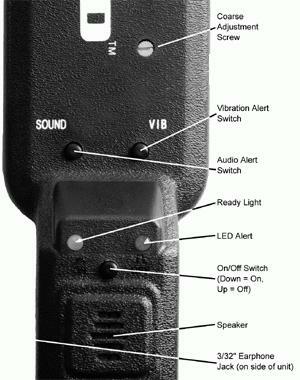 Alert Indicators: Switchable Piezo Tone Audio Alert, Vibration Alert and LED Light Alert can are used to indicate the presence of metal. The battery compartment is located at the end of the handle. To open the battery compartment, push the battery cover upward using your fingernail or a coin in the groove at the base of the cover. Slide the tray completely out of the handle. Place a nine volt alkaline battery in the tray, with the battery terminals protruding through the slots in the end of the tray (figure 1). The negative battery terminal protrudes through the larger slot, the positive through the smaller slot. Slide the tray back into the handle until it snaps into place (figure 2). The Laser Alert and Audio Alerts can be turned on (button depressed) or off (button raised) independently using the buttons in front of the on/off switch. Battery life is extended by turning off the Vibration Alert. When scanning is complete, press the “On/Off” button to turn the unit off. It is very important to know... that the while Wizard Detectors are very powerful and sensitive, they do not detect every size of metal. Please use good judgement and common sense when detecting. Very small metal objects can be missed under certain circumstances. Also direction and depth of metal objects along with density of material can cause various detection ranges. Careful scanning and visual inspection are necessary. Metal detectors are simply aids in detection and should not be thought of as a guarantee to locate every metal object. Wizard Detectors are covered by warranty for one year from date of purchase. If you have a detector that is not functioning properly please follow the instructions below. Please note that returns can take up to 10 days. Tuning should always be attempted before returning in order to save time. Some things you should know about metal detectors. When the detector is in a cold environment (below 40 degrees) they may become erratic or be caused to beep constantly. This is due to moisture content of the air that causes metal detectors to have less ability to generate and receive a magnetic signal. The detector will function better in temperatures above 40 degrees. If you need to use your detector in a temperature below 40 degrees it may be necessary to place the unit in a warm environment such as a location of normal room temperature for a period of a half hour to one hour depending on the moisture content and temperature. False signal problems can usually be overcome is adjusting the unit for ground balance. Ground Balancing. What are we actually doing when we ground balance a detector? Ground balance can be described as compensating for the phase shift of the detectors "received coil signal" because of the affects of average ground mineralization. The two basic components of a metal detectors operation is signal is amplitude, and phase response. These two components work together to cause a metal detector to signal when it is in contact with metal. The signal is generated when a detector recognizes a variance in magnetic waves that are generated by the detectors coil. When a shift in a detectors magnetic field is present the detector will emit a beeping tone. If there are a lot of metallic objects around you or you are in a location that has heavy mineralization either a loss in depth or excessive false signals may be experienced while operating the detector. Also if the ground-balance is adjusted so the detector gets quieter and the unit beeps when it is rotated to a different position either up and down or rotated left or right (mostly to the southern direction due to the polar fields), the unit in some cases may give false signals when the coil is swept over a surface. In some instances it may be necessary to have the detector facing in one particular direction (a direction that allows the detector to beep only when in contact with metal). These factors are not a flaws in the detector, believe it or not having control over the ground balance rather than having it "preset" at the factory will help you in locating buried shot. Every single metal detector made is affected by ground balance and the Earth's polar fields. Getting accustomed to your detectors sensitivity and proper tuning adjustments will help you in locating shot much easier. Fine Tuning: The Little Wizard can easily be fine-tuned or adjusted to your environmental conditions (ground-balance, humidity, etc.). Follow this procedure if your Little Wizard is displaying any of the following problems: doesn't beep, continuously beeps, works intermittently, not sensitive enough, or if you cannot set a working point. Turn the unit on by rotating the on/off/adjustment dial about half way. If the unit IS beeping, rotate the adjustment screw counter-clockwise until the beeping just stops. If the unit IS NOT beeping, rotate the adjustment screw clockwise until the beeping starts, then back off just to where the beeping stops. The unit is now fine-tuned. Test the unit on some visible metal to verify that it is working properly. If, after following these instructions, your Little Wizard is still not working properly, email us at email Billy@wizind.com. First, make sure you are using a good battery. Battery problems account for the vast majority of problems seen with the Little Wizard. 2. Remove the Cover Retaining Screw, located in the center of the underside of the unit. Use a small phillips head screwdriver (Figure 1). 3. Remove the cover, by lifting slowly from the battery end. 5. Attach a good working battery. 6. Support the battery and the unit in one hand, and hold the unit away from any metal. 7. Turn the unit on by rotating the on/off/adjustment dial about half way. 9. If the unit IS NOT beeping, rotate the internal adjustment screw clockwise until the beeping starts, then back off just to where the beeping stops. 10. Test the unit by passing the detector head over a piece of visible metal. 11. Turn the unit off, and disconnect the battery. 12. Replace the cover: Connect the cover to the base at the detector head end first, then close the cover. Tighten the cover retaining screw. 13. Re-connect the battery and replace the battery cover. The unit is now fine-tuned for your environmental conditions. Figure 3. Internal Fine Adjustment Screw - with battery connected, and unit turned on to half-way, rotate adjustment screw until the unit just stops beeping. (See instructions).